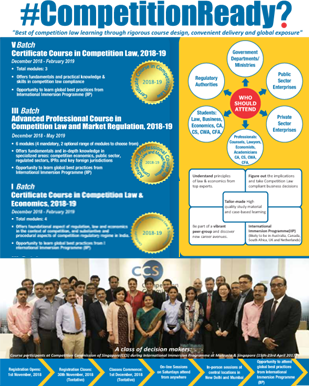 The 3-month Certificate Course in Competition Law (Certificate Course) entails study of Modules 1 to 3 namely New Paradigm of Regulation and Competition, Legal and Economic Foundation, Completion Law in India respectively during January 2019 to April 2019. The Certificate Course has been designed for professionals, who wish to fully grasp the impact of competition law on business strategy, and development competence on competition law compliance. Early Bird Discount: Candidates registering on or before 15thNovember 2018 would get a discount of 10% on course fee. "This course is highly useful for those who really wants to understand the finer details of competition law and practice it their organizations. The course provides an in-depth understanding of legal framework of competition in India through an innovative pedagogy which is a blend of online and in-person sessions. In-person sessions by the leading practitioners in this field is a unique aspect of this course which enhances the learning experience enormously." “These courses enable participants from a range of backgrounds to acquire a good academic and practical knowledge of competition law in India. The diverse faculty – drawn from academia, the institutions and legal practice - allows the subject to be seen from various perspectives. Practical exercises test the mettle of participants. Successful participation in these prestigious courses will give a good grounding in competition law and practice. It has been a real pleasure to help teach this course over the past few years and see students enthusiastically develop and apply their knowledge in this field." "The course is extremely well structured, Blending the academic and practical aspects of competition enforcement in India. It was a delight to teach one of the modules of this course. I found the class consisting of consisting of officials from private and public sector; lawyers; regulators; students etc to bring in their own perspectives to the classroom- making for a lively discussion." “The course in very professionally managed and the Faculty is extremely competent to keep the participants interested all the time”.